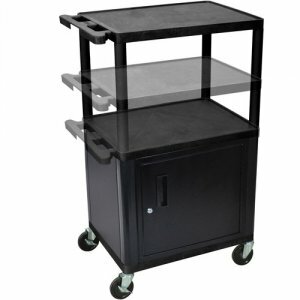 Black Adjustable Multi Height AV Utility Cart with 3 Shelves and Locking Cabinet. 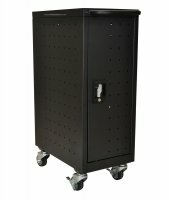 Luxor's presentation station has 3 shelves and legs made from high density polyethylene structural foam molded plastic. Integral safety push handle which is molded into top shelf for sturdy grip. Top shelf reinforced with one metal bar. 1/4" retaining lip and sure grip safety pads. "Cable track" cord management system keeps cords neatly secured. Cabling hold in top shelf with cord guide cover. 4" ball bearing casters, two with locking brake. Multiple legs included to make different height options. Dimensions: 24"W x 18"D x 16" - 42"H - Includes multiple leg lengths to make a 16", 26", 35 1/4" or 41" height cart. Includes steel cabinet with lock and two sets of keys. Cabinet models are made from 20 gauge steel with a powder coat paint finish. Includes recessed door handle and full piano door hinge for maximum strength.